All Web addresses mentioned were functional as of 7-27-18. From the Cumberland Gap to the Atlantic Ocean, this is Virginia Water Radio for the week of July 30, 2018. This week, we explore a formerly hoppin’ southwestern Virginia crossroads whose two-word name tells a tale of landscape, water, and seasonal aquatic creatures. Have a listen for about 10 seconds to these mystery sounds, and see if you can guess this crossroads’ name. The sounds are your hint to the first word of the name, and here’s a hint for the second word: water on it doesn’t flow downhill, and people on it tell the truth. If you guessed Frog Level, you’re a Virginia geography expert! Along U.S. Business Route 19 in Tazewell County lies a large, flat, seasonally wet area that attracts lots of loud amphibians in spring and summer. 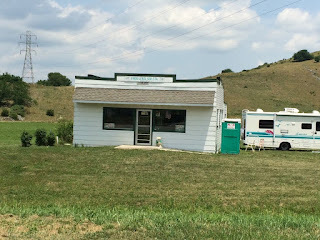 Just uphill from that area, where Route 19, U.S. Route 460, and State Route 16 all meet, the Frog Level gas station plus store and tavern was a popular spot for gathering, socializing, and politicking from 1932 to 2007. The colorful history of the business even included the creation by bar regulars of the Frog Level Yacht Club, with t-shirts that joked about refueling schooner vessels. 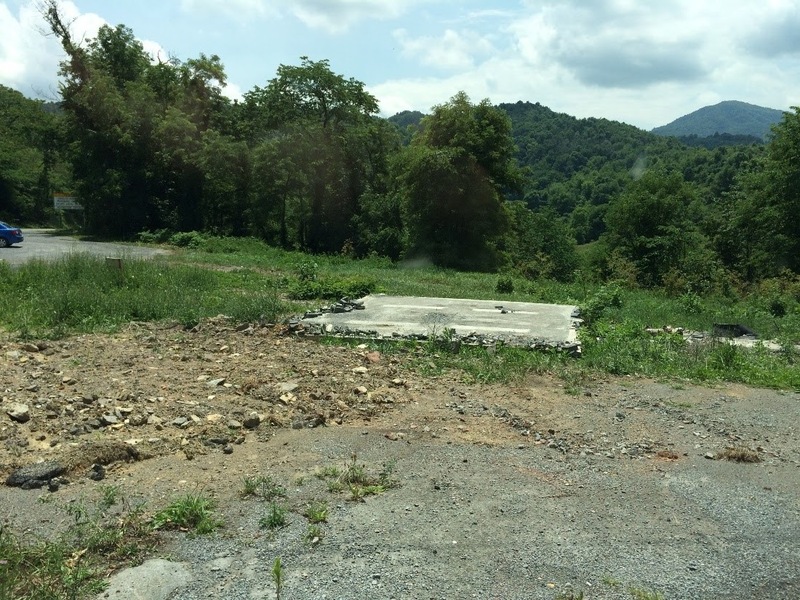 In 2009, the historic building was moved about two miles to a spot adjacent to Tazewell’s Crab Orchard Museum. 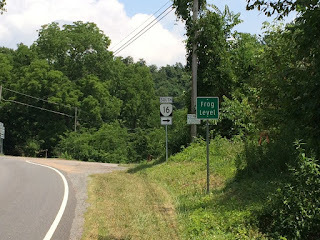 Tazewell County is by no means the only locality to claim an area called Frog Level. That water feature-and-creature-based name also is found, for example, in Caroline County, Virginia; in Waynesville, North Carolina; in Carter County, Tennessee; and in Fayette County, Alabama. In Caroline County, the Frog Level Volunteer Fire Department has held an annual festival and parade since 1969. In the North Carolina and Alabama cases, the name was applied to low, flat areas where the first railroad tracks were laid. And in Tennessee, Frog Level is a remote, mountainous area of streams, waterfalls, bogs, and—one can presume—seasonally breeding and calling frogs. Other wildlife-based names also add a natural-resource perspective to Virginia’s geography and history. The Commonwealth is home to Buffalo Gap, Clam, Dolphin, Ducks Store, Possum Trot, and many others. But, at least from a water perspective, creature place names don’t get much more descriptive or fun than Frog Level. Virginia Water Radio is produced by the Virginia Water Resources Research Center, part of Virginia Tech’s College of Natural Resources and Environment. For more Virginia water sounds, music, or information, visit us online at virginiawaterradio.org, or call the Water Center at (540) 231-5624. Thanks to Stewart Scales for his banjo version of Cripple Creek to open and close this show. In Blacksburg, I’m Alan Raflo, thanking you for listening, and wishing you health, wisdom, and good water. The frog sounds heard in this episode—all recorded by Virginia Water Radio in Blacksburg, Va.—were Gray Tree Frog, Green Frog, and Spring Peeper, recorded on May 13, 2013 (first sounds) and Green Frogs, recorded on August 1, 2016 (closing sound). Virginia Water Radio thanks Jess Jones, U.S. Fish and Wildlife Service and Virginia Tech Department of Fish and Wildlife Conservation, for suggesting and helping with this episode. 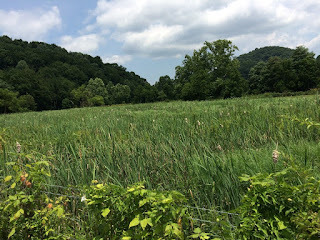 Wetland area at Frog Level in Tazewell County, Va., July 13, 2018. Frog Level sign at U.S. Route 19, U.S. Route 460, and State Routh 16 intersection in Tazewell County, Va., July 13, 2018. Remains at the former site of the Frog Level store in Tazewell County, Va., July 13, 2018. 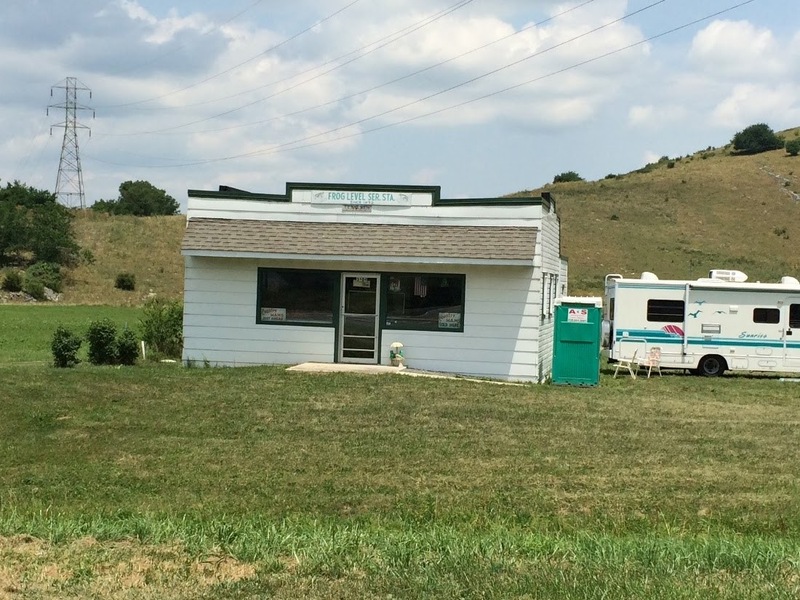 Former Frog Level store building at a site adjacent to the Crab Orchard Museum on U.S. Routes 19-460 in Tazewell County, Va., July 13, 2018. City of Fayette, Alabama, “A Brief History of Fayette,” online at http://fayetteal.org/about/. Crab Orchard Museum, online at https://www.craborchardmuseum.com/. Frog Level Farm, Aylett, Va. (King William County), online (via Facebook) at https://www.facebook.com/pages/Frog-Level-Farm/161088237254620. Frog Level Volunteer Fire Department (Caroline County), online (via Facebook) at https://www.facebook.com/Frog-Level-Volunteer-Fire-Department-152122678162630/. Historic Frog Level Merchants Association, “Historic Background of Waynesville [Haywood County, N.C.] & Frog Level History,” online at http://www.historicfroglevel.com/frog-level-history/. Kevin Kittredge, Fans of Frog Level Service Station preserve Tazewell County icon by moving it a hop, skip and jump away, Roanoke Times, 3/26/11. Bill Lohmann, Welcome to Frog Level, a short hop to good living, Richmond Times-Dispatch, 10/28/15. Virginia Tourism Corporation, “Frog Level Fire Department Festival and Parade,” online at https://www.virginia.org/listings/Events/FrogLevelVolunteerFireDepartmentFallFestivalandParade/. All Water Radio episodes are listed by category at the Index link above (http://www.virginiawaterradio.org/p/index.html). See particularly the “Amphibians” subject category. Episode 110, 5/14/12 – A Walk across Virginia. Episode 140, 12/10/12 – Exploration of the Chesapeake Bay. Episode 181, 9/30/13 – Water and settlement of Roanoke. Episode 265, 5/11/15 – A Water-based Look at Geography. Episode 156, 4/8/13 – A Watersheds Lesson. Episode 209, 4/14/14 – One Big Blue Ridge Helps Create Three Big Virginia Rivers. Episode 251, 2/2/15 – A Musical Tour of Rivers and Watersheds. Episode 379, 7/31/17 – Water at the Heart of Virginia's Western Highlands. 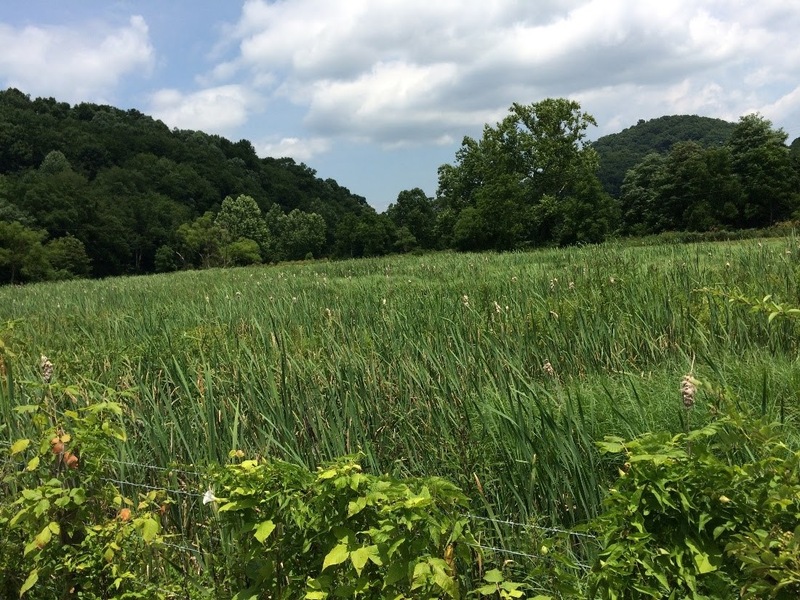 6.7 - natural processes and human interactions that affect watershed systems; Va. watersheds, water bodies, and wetlands; health and safety issues; and water monitoring. ES.1 – current applications to reinforce science concepts. BIO.1 – current applications to reinforce science concepts. BIO.8 - dynamic equilibria and interactions within populations, communities, and ecosystems; including nutrient cycling, succession, effects of natural events and human activities, and analysis of the flora, fauna, and microorganisms of Virginia ecosystems. VS.10 – knowledge of government, geography, and economics in present-day Virginia. WG.2 - how selected physical and ecological processes shape the Earth’s surface, including climate, weather, and how humans influence their environment and are influenced by it. Following are links to Water Radio episodes (various topics) designed especially for certain K-12 grade levels. Episode 250 (1-26-15) – on boiling, for kindergarten through 3rd grade. Episode 255 (3-2-15) – on density, for 5th and 6th grade. Episode 282 (9-21-15) – on living vs. non-living, for kindergarten. Episode 309 (3-28-16) – on temperature regulation in animals, for kindergarten through 12th grade. Episode 332 (9-12-16) – on dissolved gases, especially dissolved oxygen in aquatic habitats, for 5th grade. Episode 403 (1-15-18) – on freezing and ice, for kindergarten through 3rd grade. Episode 404 (1-22-18) – on ice on ponds and lakes, for 4th through 8th grade. Episode 406 (2-5-18) – on ice on rivers, for middle school. Episode 407 (2-12-19) – on snow chemistry and physics, for high school. Episode 430 (7-23-18): What Calls from a Marsh?